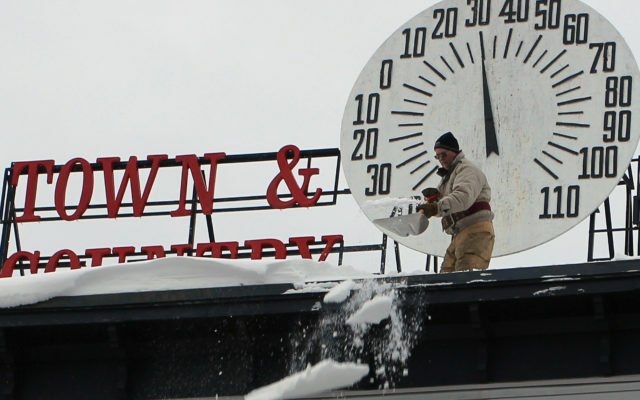 HOULTON, Maine — With the remnants of last week’s major storm still prevalent, officials from the Houlton Fire Department lent a hand removing snow from rooftops Thursday morning in downtown Houlton. 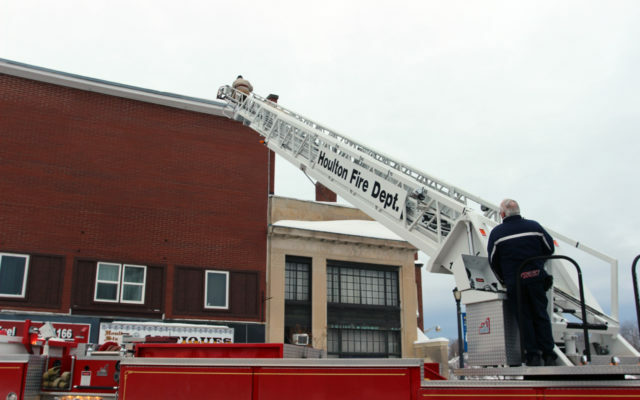 The department’s ladder truck was used to gain access to the roofs of several three-story buildings in downtown Houlton so that overhanging snow could be removed before it presented a danger. “We knew the snow was probably going to fall down, so we figured we would help clear it out so that it does not fall onto people and cause any injuries,” Houlton Fire Chief Milton Cone said Thursday. Houlton Firefighter Kevin Tingley, who is also the town’s code enforcement officer, ascended the ladder and helped clear snow from the roofs while Chief Cone and new Town Manager William MacDonald aided in traffic and pedestrian flow. Chief Cone said clearing roofs of snow is something every resident should consider, given the amount of precipitation that fell during last week’s storm. The blizzard dubbed Grayson dumped about a foot and a half on the area, but the accompanying high winds caused drifts that were much higher in spots. “Yesterday and today have been the first days where we have not had any precipitation so this was a good opportunity for us to review the snow on our roofs,” MacDonald said. Cone added that the snow was relatively light, and therefore could be removed quite easily, but that may change when rain and ice move into the area Friday and Saturday. The town’s public works department also has been busy hauling snow from the two municipal parking lots following last week’s storm. The snow is hauled to a large field located on Hillview Avenue.